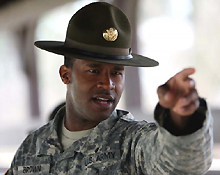 Fort Jackson is the largest and most active Initial Entry training Center in the U.S. Army, training 34 percent of all Soldiers and 69 percent of the women entering the Army each year. Providing the Army with trained, disciplined, motivated and physically fit warriors who espouse the Army's core values and are focused on teamwork is the post's primary mission. That means training in excess of 45,000 basic training and advanced individual training Soldiers every year.